Well-appointed Restored 1930’s Cottage Close To More Than 50 Wineries. Every detail was considered in restoring our 1930’s cottage to make your stay a lifelong memory. Lush beds with premiere memory foam/gel infused mattresses and luxurious silk-filled comforters. Charm doesn't begin to describe the decor of Chalet Vigne. Carrara marble counter tops in the kitchen add to the timeless feel of the fully equipped kitchen complete with stainless steel appliances. The Keurig Beverage System offers a variety of complimentary coffees, teas, and hot chocolates. After a long day of activities, you can soak in a vintage clawfoot bathtub/shower. Chalet Vigne is situated at the crossroads of three wine country regions, Amador County Shenandoah Valley, Fairplay Wineries of El Dorado County, and the famous Fiddletown Zinfandel vineyards. Within minutes, you can explore over 50 wineries of the Sierra Foothills. Many award-winning wines are rooted in our wonderful soil that mimics the Mediterranean soil and climate. Rich in the history of the California Gold Rush era, the area has something for everyone: Wine tasting, incredible restaurants, vintage towns with antique shops, guided gold-mine tours, hiking, cave spelunking, concerts and of course, just enjoying the fantastic scenery. You have full access to the entire cottage that is beautifully decorated consisting of 2 bedrooms (larger bedroom with one king bed, smaller "Marilyn Monroe" bedroom with one queen bed and bedside tables, once owed by June DiMaggio, niece of Joe DiMaggio. June introduced Marilyn to Joe. If only those tables could talk! 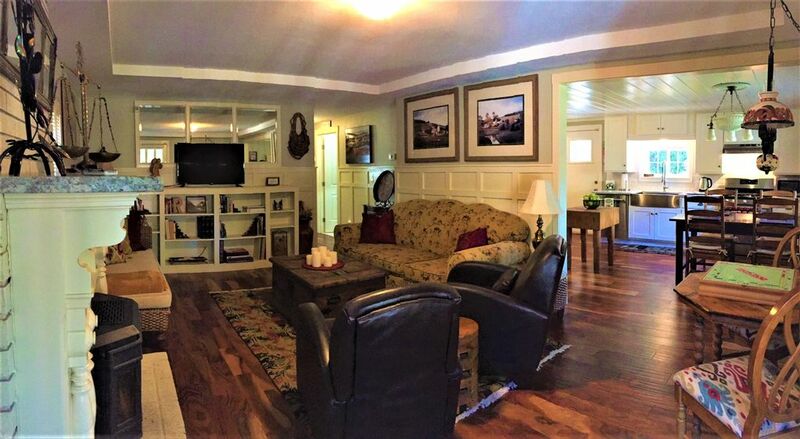 ), 1 bath with a vintage soaking clawfoot tub, a large kitchen with a dining area for 6 people, a spacious living room with a sofa, recliners, chaise lounge and a game table. An outdoor seating area around a fire pit is great for sipping wine and chatting. Summer meals can be enjoyed outside at a large picnic table. River Pines was developed in 1927 as a vacation destination. It is a rural community with narrow winding streets located on the South Fork of the Cosumnes River. Back in the day, small cabins were built as summer homes for folks from the San Francisco Bay Area and the Sacramento Valley. Most recently, the area has regained popularity as the cabins are being restored and the area has exploded as a very desirable wine country destination. Rocky and I have had a lifetime of adventures. Whether it was starting and growing a successful business, or traveling to faraway lands to manufacture electric bicycles, we are together every day. The latest chapter in our life is all about restoring 1930's vacation cottages for others to enjoy. It's about making a difference in a community. We work and play together as a team. One of us just isn't complete without the other. In our spare time, we love to explore the Sierra Foothills in our vintage 1960 Porsche. It's a blast to navigate the hills on the scenic country roads, and arriving in style at the wineries, always turns heads. Could life get any better! High-end linens are provided for your comfort. Plenty of seating with a sofa, two recliners, and a chaise. Very comfortable! Fully equipped kitchen with high-end appliances. The coziest VRBO we've ever had! that you can feed by hand! I can see that this is a lovely retreat for any time of year. Thank you for the wonderful review. It’s our goal to earn 5-Stars. Please come back soon! You are awesome guests. Any host should be happy to have you stay in their rental. Happy New Year! Love the place! So warm and comfortable. My wife and I celebrated a anniversary here! Rocky and Nell were so warm and inviting. Completely renovated with charming decor! Right in the middle of wine country and such a close and easy drive to everything. Really comfortable master bed with an amazing silk stuffed comforter! This place has an amazing kitchen with everything you need! We will be returning soon !!! Thank you for the fabulous review. You are 5-Star guests and any host should not hesitate to offer their vacation rental to you. A perfect romantic cottage in the middle of the Fair Play and Shenandoah wine countries. Charming and very comfortable getaway for the two of us with cool touches (very comfortable king bed, claw footed tub, fully stocked Keurig coffee maker). And if you love animals like we do, you have deer, squirrels and a whole hutch full of bunnies running around the property. Altogether a wonderful weekend getaway and we'll be coming back. Thank you for the wonderful review. We’re so glad you enjoyed your stay at Chalet Vigne. Come back soon! Very charming, cozy and everything you need in this beautiful wine country! Chalet Vigne provides everything you need to tour Amador Wine Country. It’s very clean and new with traditional charm proving a warm and cozy stay with very comfortable bedrooms and sleeping experience. The owners are very sweet and accommodating providing a seamless experience. Not to mention the darling bunnies roaming the area, you may wake up and see a furry little friend in the front yard while your sipping on your morning coffee. Thank you so much, we really enjoyed our stay. Thank you for leaving the cottage in perfect condition. We have refunded your security deposit instead of waiting a week. Come back soon! Nell and Rocky were great hosts, very helpful and kind. Carrots for the bunnies were a nice touch, too! Glowing reviews all the way around - place was great, very comfortable, clean, and all the updated vintage features were a great touch. I'd like to give a bad review so that not everybody would want to book this place and that would mean that it would be easier for me to be able to book it in the future, but there was nothing to criticize despite my own selfish designs! The cottage is charming and it is in real life as it is in the pictures. Nell and Rocky were gracious hosts, even providing us a nice bottle of zinfandel from Perry Creek Vineyards. The cottage is a great departure point for exploring the wonderful wineries of Amador and El Dorado County. Rocky said he is renovating a cottage on the south fork of the Consumes River and if it is anything like Chalet Vigne my wife and I can't wait to visit. Thank you for the wonderful review! Come back soon. We’ll let you know when the river cottage is finished.